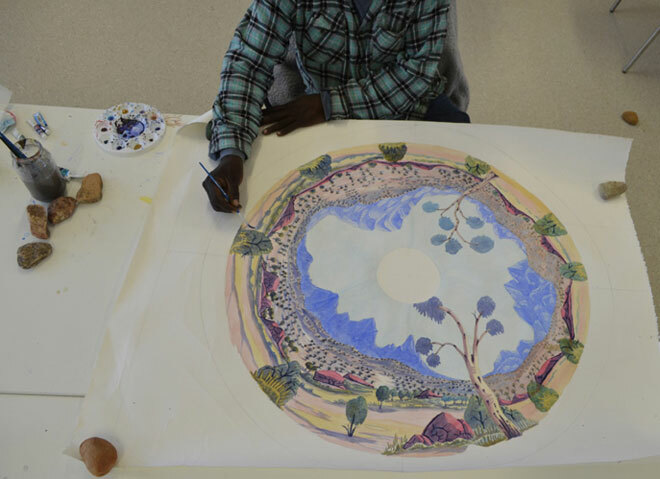 Kevin Namatjira working on his circular-format landscape which will be digitally printed onto silk to make a 1950s style skirt. 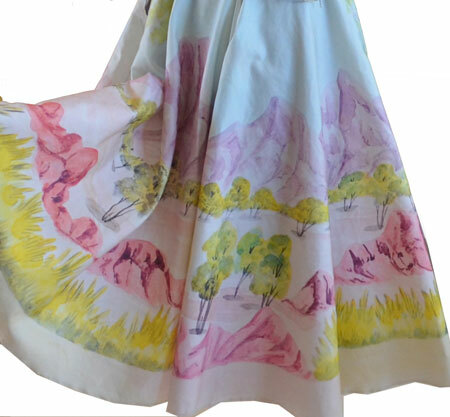 Transferring delicate visions of the desert landscape in the Namatjira tradition to limited edition silk circle skirts and scarves is the latest innovative project from Ngurratjuta Many Hands artists in partnership with Batchelor Institute. And they are using crowd funding to back the venture: you give them a donation of $50 or more and they’ll give you “a tax break”, as Mervyn Rubuntja says. Funds are needed to pay for the reproduction of the artists’ work and the tailoring of the garments.He is one of five male and and four female artists to take part. They include the late Mr P. Taylor who tragically died in a car accident in December. His leadership, strong sense of humour and talent is greatly missed at the art centre. Other artists involved are Lenie Namatjira, Gloria Pannka (her skirt at left), Kevin Namatjira, Hubert Pareroultja, Rienhold Inkamala, Gwenda Namatjira and Therese Ryder. They call this wearable art project “Inti Ljapa Ljapa Irapakalam”, which in English means “butterfly going round and round” – the caterpillar and butterfly being iconic to the Arrernte tradition. In Alice Springs the work – both the garments and the original paintings – will show at RAFT artspace, 15 May to 6 June, and in Sydney at the “We are in Wonder LAND” exhibition, curated by Desart and the National Institute for Experimental Art. Many Hands aims to raise $7000 through the crowd funding site Pozible by April 12. As of last Friday $1315 had come in.